EJ and I spent the morning quietly. I listened to classical violin/piano music as we browsed the Internet and enjoyed the warmth of the wood stove. We sipped our coffee surrounded by cuddly cats and watched the birds and squirrels at the feeders. At about 11 a.m. I woke JJ and he leisurely took his shower at got dressed. At around noon–give or take a few minutes–we drove off to have Thanksgiving dinner at Denny’s in a nearby town. I know that most people would be horrified that we had Thanksgiving dinner at a diner because it carries a stigma of family-less, friend-less loneliness. However, we had the Thanksgiving we really wanted. JJ doesn’t really feel up to large social gatherings and EJ is exhausted from many hours of overtime. The thought of a hectic large gathering felt exhaustingly overwhelming. Also, trying to cook a turkey dinner with all the fixings for just the three of us felt like too much work. Going to a restaurant felt as if we were doing something special AND relaxing. We got to enjoy the dinner without the work. Even though we were among strangers, we felt a great deal of togetherness. We had never gone to this particular Denny’s before. The Denny’s we usually go to in the bigger city is a nice restaurant. This Denny’s was a classic retro diner, which felt funky and fun. The wait staff were all cheerful and relaxed. Unlike in the movie The Santa Clause, the waitress’ name was not Judy. However, I was thrilled when I asked if they had eggnog and the waitress replied, “No, I’m sorry.” We ordered turkey dinners, of course. Usually we don’t ever order desserts at restaurants because we are too full after the meal…but, hey, this is Thanksgiving, right? We decided to order desserts that we don’t make at home….so we all had shakes. EJ and JJ ordered chocolate and peanut butter shakes. I was tempted because I love peanut butter flavored food, but I decided to order a cinnamon apple pie shake. It was very good. EJ let me taste his shake and I let the guys taste mine. 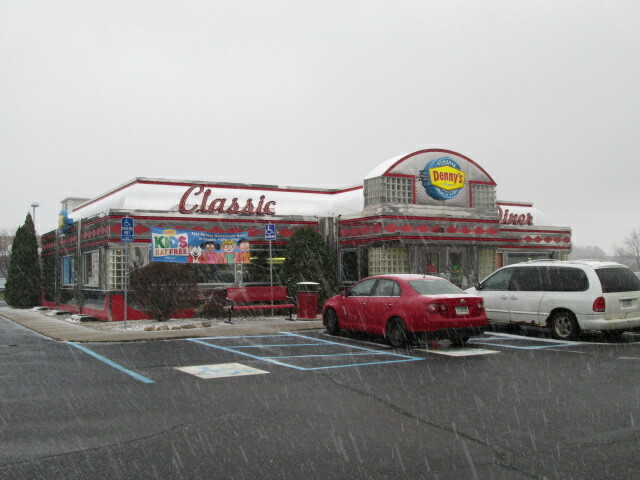 As we left the diner, it was snowing hard. The snow was actually graupel, which is small round snow pellets rather than flakes. When we got home, we had a quiet afternoon. I took a nap. It actually was a wonderful Thanksgiving. Sometimes I think the deeper meanings of holidays get buried under the weight of busyness and expectations and obligations. Sometimes “simple” feels more meaningful to me. On the way home, I told EJ and JJ that maybe every Thanksgiving we ought to go out to eat or do something nontraditional. It was fun. Your “special day” sounds like it was just perfect, being with our loved ones and remembering why we are so thankful, and the list is long. Our day at St. Peter’s was a blessing for so many, it is hard to find a more giving group of men women and children than our small community of ER. We are a blessing to one another, enjoy the coming Holy Season of Christmas and see you soon. I am glad you and Bob had such a good day, Linda!